If the term, 'rare' could be classified as an animal, it would be a teddy bear compared to the monster that would classify the scarcity of this parallel set. With a print run of just 30 copies, an insertion ratio of 1:300, and an absorption interval that lasted likely just a few brief months after initial release date, with respect to superstar and even star power, the market has all but dried up completely. 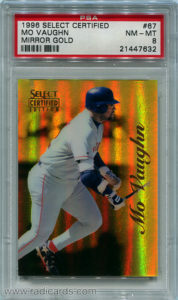 Ladies and gentlemen, I'm talking about the famous 1996 Select Certified Mirror Gold parallels. These are cards everyone wants but nobody has. When you do see them, it's an all out bloodbath. While this is the obvious case with stars and even sometimes minor stars, commons also hold a high degree of desirability. For reference, the following is a list of 20 recorded sales of cards from this preminent parallel set. Depending on who you collect, you may have to shell out big bucks for your guys Mirror Gold parallel... if you can find one. These parallels are less of a search and more of a mythical treasure hunt. It's really quite difficult to describe how incredibly tough these cards are to locate. I believe that a lot of this has to do with the fact that many of these were hoarded by collectors, investors, and set builders when the product was released. I can't think of any other reason why anyone would have to search for literally decades to find their guys Mirror Gold parallel. Aside from a few common players here and there, stars just don't surface often and in all of the years I've searched, I've seen very few superstars surface. Believe it folks, this is one of the most, if not the most desirable, respected, and scarcest parallel sets in all of baseball cards that's printed in a quantity above 1. Another release with similar market strength is the ultra tough red parallel from the 1998 Donruss Crusade set. My first encounter with a card from this set was at the 2015 National Sports Collectors Convention in Chicago, IL. I stood in awe as I appreciated the design of this one gorgeous example of the Rey Ordonez. I have always wanted to see one of these 1996 Select Certified Mirror Gold parallels in person, no matter the player, and they are absolutely stunning. I've since added the Mo Vaughn depicted here so I can continue to enjoy the in-hand experience. If that Mirror Gold was in fact the 1996 example, the current market appears to be very strong. As with anything, however, it’s only worth as much as someone is willing to pay for it. For me, I’d pay handsomely for one. The best advice I can give you is to look at the prices of eBay Completed Sold listings for comparable players. I’ve found this information to be helpful in my interactions with sellers of rare cards where sale records are difficult to find. Great article, Patrick! I had so much fun collecting these cards back in the day (and still do!) I’d bought a box in ‘97 or ‘98 and pulled a Jason Kendall mirror blue from it. It’s always exciting when you open a pack and see the edge of something special.